Note: You can enter this giveaway three (3) times per e-mail address per day. Deadline is 11:59PM ET 7.21.18. Cravings for comfort food can come at any time. 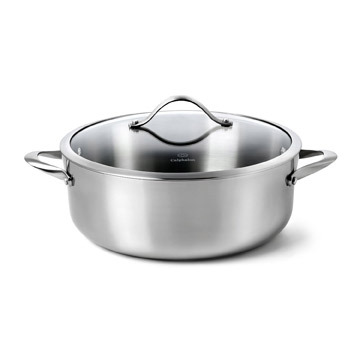 Whether you choose Chicken Noodle Soup made with leftover chicken or a classic Pot Roast with Potatoes and Vegetables, the Calphalon 8-quart Dutch Oven is the perfect pot. It boasts a heavy-gauge aluminum core sandwiched between two layers of stainless steel providing superior durability, conductivity and even heating. The clear tempered-glass lid not only allows you to see food while it’s cooking but also self-bastes meats. Meanwhile the brushed stainless steel handles stay cool on the stovetop. The pot is also oven-safe, so you can finish dishes in the oven or keep them warm until it’s time to serve. One pot to cook, serve, and clean is comforting indeed. NO PURCHASE NECESSARY TO ENTER OR WIN. Void where prohibited by law. Open to legal residents of the 50 U.S., D.C. and Canada (excluding Quebec) who are at least eighteen years old at the time of entry and have internet access. Begins on 5.25.18 at 12:00:00 a.m. ET and ends on 7.21.18 at 11:59:59 p.m. ET. To enter the giveaway, submit your full name and email address on this form. Odds of winning this giveaway depend on the total number of eligible entries received. Only three (3) entries per email address per day. Sponsored by Leite’s Culinaria, Inc. For more information, visit our Official Rules. For a list of winners, check out our Very Happy Winners page. Be sure to add giveaways@leitesculinaria.com to ensure notification if you are the winner.